If you have more than one StarLicense server in the network, you can configure backup servers for failover so that requests to the Primary server for license connections can be fulfilled even if the Primary server fails or the service is stopped. Note that the failover StarLicense server does not require a license key. Follow the steps in one of the below sections, depending on which computer operating system the server is running. Click the Add button of the Failover tab in the configuration for the backup server. In the Add Primary Server dialog, enter the Host Name or IP address of the Primary server and click OK.
On the StarSQL client, configure the License Configuration with the failover server location. On the License Servers tab, click the Add button to add a license server. Enter the Host Name or IP address of the failover server, select SECONDARY as the role, and click Add. After the StarSQL License Configuration verifies connectivity from the client to the failover server (this is performed automatically), review the configuration to ensure that both PRIMARY and SECONDARY servers are configured. 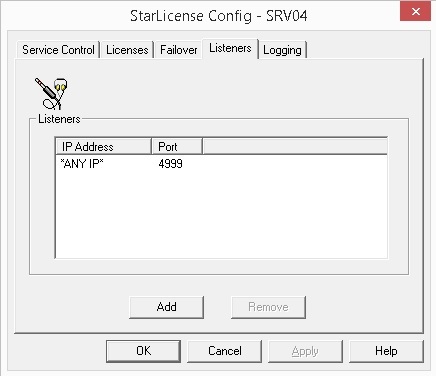 Stop and restart the StarLicense service from the StarLicense Configuration Menu. On the StarSQL client, configure StarLicense with the failover server location. Identify the active StarLicense.properties file, which typically resides either with the JDBC jar file, or in the application's active directory, which varies by JDBC application. When you do this, the licensing configuration created with StarSQL License Configuration (Starlic.exe on Windows) or /etc/starlicense.rc (UNIX) goes into effect for the JDBC driver. TCP Port 4997 is used for communication between the primary and secondary StarLicense servers; firewalls should allow communication on this port to be initiated from either server. TCP Port 4999 is used from communication from the client to the servers; firewalls should allow communication on this port to be initiated from the StarSQL clients to both servers. The value of this port is configurable.